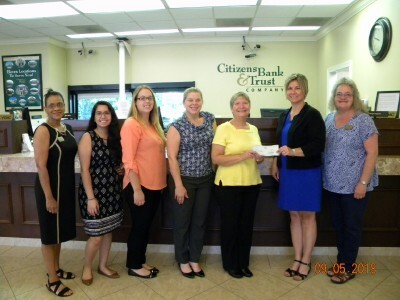 The Amelia branch of Citizens Bank donated the proceeds from their company’s May fundraiser to Amelia Patrons for Animal Welfare, Inc. (APAW). The eleven (11) state branches hold a Denim Day once a month and each employee who wishes to wear jeans must donate $5.00 to the fundraiser. Then employees choose a deserving charity to which they donate each month’s funds. Accepting the May donation check from Branch Manager Robin Gough is APAW Vice President Cindy Case.